Apparently the three little pigs have decided to leave behind their traditional home environment and head off to the Alaskan bush in Alaska’s Three Pigs. 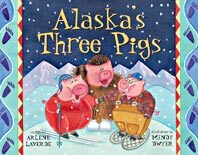 In this version of the classic tale written by Arlene Laverde, illustrated by Mindy Dwyer and published by Sasquatch Books (2000), the three pigs decide to travel by biplane to Alaska where they will build homesteads, fish, hunt, play and eat canned yams. The pigs are captivated by their new environment and spend the summer camping and playing rather than building homes. It isn’t until the weather turns cold enough for them to have to dig out their winter coats that they start looking for home sites. The first pig is not very industrious and settles for a broken down cabin that has been abandoned for some time. After tossing his belongings in the cabin he heads out to snowboard. The second pig actually constructs a house of simple branches, grass and moss in the open tundra before he heads off to ski. The third and most industrious pig builds an igloo made of ice bricks before he heads off to ride on a dog sled. The pigs are loud and noisy as they participate in their particular winter sports and soon wake a sleeping grizzly. The bear is hungry and ornery and longing for pork. You can guess what happens next. The pigs rush home when the bear’s grumblings are heard only to have him destroy two of their homes. The pigs all survive in this version of the story and so does the bear. He falls into a water barrel the third pig had set up for his drinking water. The barrel is dragged outside containing the bear. After a brief time he is wheeled to his cave, encased in ice. Alaska's Three Pigs is filled with action and humor. The illustrations by Mindy Dwyer are colorful and playful. The primary colors of the illustrations are picked up and used in accented text throughout the story. We loved the descriptive words and pictures in this book. He loved pretending to make the pigs walk, ski, and run using these puppets. I chose to not add decorations or costumes to the pigs so we can use them again with other versions of the story. Thank you so much for the oppotunity to share this review. Thank YOU for contributing a great book and an insightful review, Deirdre! I think Alaska's Three Pigs would be an interesting model to use with kids to ask them to make up their own variation of the classic tale. They could come to Australia and bring a boat and cyclone repellent! This is great - thanks for sharing! My family always enjoyed winter sports - and my kids would have LOVED this book when they were little! Deb, that's a good point and an added advantage of a book set in a winter landscape! This sounds just wonderful. I am fascinated with all things Alaska - real or fictional - so this one goes on the TBR pile!! Thanks Ms. Chook. Thank Deirdre, Terry! I'm so pleased to broaden the scope of The Book Chook with reviews and articles from writers around the world. I'm rather fascinated by snow and so are my kids. I think we would enjoy this version of the 3 little pigs. Snow IS fascinating when you're not used to it, right? I remember how excited I was in the US when it started to snow, running around outside, tasting it, scraping up slush to try to make a snowball etc. Strange thing was, I was the only one doing that! The story sounds really silly and fun! Kids would just love it! Silly and fun is perfect when it's wrapped inside a book - I agree, blueviolet!